Pulmonary system definition for NASM will include a basic understanding of the heart, its chambers, valves, arteries and the lungs. Let's start with the heart. Skeletal muscle moves the skeleton. Some muscle in the heart is only found in the heart. Smooth muscle is found in internal organs. The structure and function of heart muscle is different than other muscle in the body. You need to understand the basic functionality of the heart, lungs and circulatory system during rest and active states. Where is your heart located in the body? What are the names of the chambers and where are they located? What are the heart valves called and where are they located? What is the ‘pacemaker' for the heart? 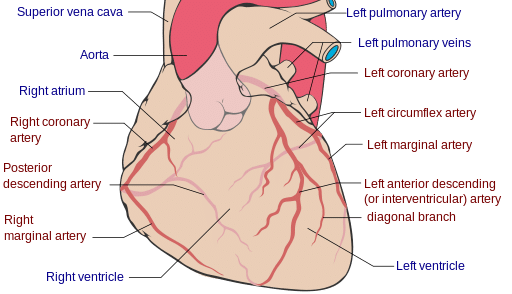 When blood leaves the left atrium, where does it go? 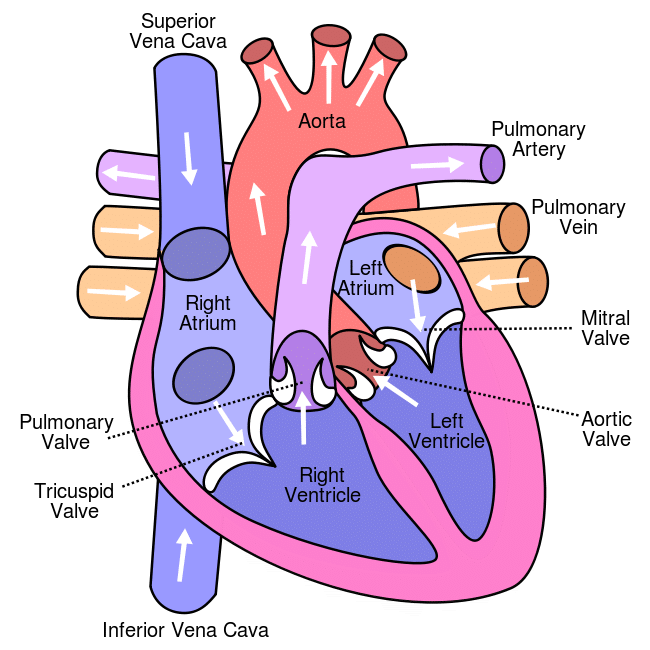 What does the right ventricle do? When you do cardiovascular training, what adaptations occur and which do not? What is stroke volume of the heart? What happens during ventricle systole? Which muscles are used for expiration (breathing out)? What are normal responses to exercise in blood pressure and what are not? What is Angina and what are the classic signs of Angina? What is the stroke volume for the average person? How to calculate the Karvonen formula? What is the physiology of the heart beat? Can you describe cardiovascular blood flow? What is the AV node? How can an arrhythmia effect exercise? Which are the coronary arteries? 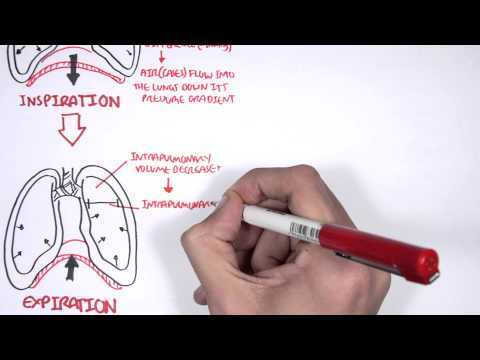 What is the pulmonary system definition? What is the respiratory pump? What is the definition of breathing or ventilation? Which muscles are used for inspiration at rest and during exercise? Which muscles are used for expiration at rest and during exercise? What percentage of your blood cells are red blood cells? What is the definition of phagocytizing? What are the functions of blood platelets? Which lung is bigger, your right or left? How many lobes are in your right and left lung? What is your trachea and epiglottis? What are the definitions of arteries, veins and capillaries? How can you calculate Stroke Volume(SV)? Is there a difference in Stroke Volume between a non-athlete and an athlete? How do you calculate target heart rate (THR)? What is the NASM method to determine Max Heart Rate? What is the new NASM method as of the NASM 5th Edition to calculate the Max Heart Rate? What are the typical adaptations to cardiovascular (CV) training? What happens to the following as a result of CV training? It is important to realize that you lose cardiovascular fitness faster than muscular strength. In fact, cardiovascular fitness is lost after 48 hours of inactivity. Therefore, now you know that you want to do cardiovascular exercise at least once every 48 hours. Even better will be to make sure that you do at least 30 minutes of moderate CV exercise 5 times a week. This will give you 150 minutes of CV exercise per week, which is the recommended amount. In any case, cardiovascular fitness is going to improve your pulmonary system. The pulmonary system is going to deliver oxygen to your cells, as well as remove carbon dioxide. Besides oxygen, the blood delivers glucose, hormones, vitamins, minerals and amino acids to all of the cells of your body. Your job is to feed your body the fuel that it needs and can use to function best. Your need for oxygen in your muscles will depend on your activity level. Meaning, the amount of oxygen pumped is equal to the metabolic demands of muscle. The heart delivers oxygen to your muscles. Let's explore the heart a bit further to answer our pulmonary system definition questions from above. Your heart is located behind your sternum, your breast bone, in a protective sac. This sac is called the pericardium sac. The pericardium sac also contains a small amount of fluid, is attached to the sternum. Your heart is not directly behind your sternum in the middle of your chest. It is towards the left side of your body. In addition, the heart is tilted a bit to the left. Your heart is on average the size of your fist. The size of the heart is usually related to the size of the body. Men usually have bigger hearts and muscle mass. This is the reason that men sometimes can outperform women depending on the sport. The heart has four chambers, four cavities. Two are on top and two are on bottom. There is a right side of the heart and a left side of the heart. What are the names of the chambers? The top chambers are called the Atria. The bottom chambers are called ventricles. The ventricles are bigger than the atria. The Atria collect blood which is returning from the body to the heart. The Ventricles pump blood from the heart to the rest of the body. The top right chamber is called the right atrium. The right atrium collects blood from the Superior Vena Cava. When the right atrium contracts, the blood is pumped through the tricuspid valve into the bottom right chamber, the right ventricle. The blood that is in the right ventricle is low in oxygen, because this is blood that has been returned from the body to the heart. When the right ventricle contracts, the blood is pumped through the pulmonary valve of the pulmonary artery. The pulmonary artery splits into two and delivers the blood to the right and left lung. When the blood has been filled with new oxygen in the lungs, that blood is returned to the heart into the left atrium by the pulmonary veins. The collected blood in the left atrium is pumped through the bicuspid valve to the left ventricle. The bicuspid valve is also known as the mitral valve. The left ventricle then pumps the blood through the Aortic valve into the Aorta artery which distributes the oxygenated blood to the rest of the body. One valve is between the right atrium and the right ventricle. The name of this valve is the tricuspid valve. A second valve is between the right ventricle and the pulmonary artery. This valve is known as the pulmonary valve. A third valve is between the left atrium and the left ventricle. This valve is called the bicuspid valve and is also known as the mitral valve. And the fourth valve is between the left ventricle and the Aorta artery. This fourth valve is called the Aortic valve. The right atrium collects blood from the superior vena cava and the inferior vena cava. The superior vena cava returns blood from the upper body to the right atrium. The inferior vena cava returns blood from the lower body to the right atrium. The Vena Cava is the largest vein in the body. Veins always return blood back to the heart. Veins are usually most visible near the skin. They have a bluish tint because the blood in the veins are low in oxygen. Arteries always take oxygenated blood away from the body to the rest of the body. When the doctor listens to your heart, s/he is most likely listening to your valves. Blood returns to the heart, low in O2 (Oxygen), and enters the right atrium through the superior vena cava and the inferior vena cava. Blood then passes through the tricuspid valve into the right ventricle. The right ventricle then pumps blood through the pulmonary valve into the pulmonary artery for delivery to the lungs. The pulmonary artery splits in two and goes to the two lungs and picks up O2. At this point, the blood should be saturated with blood 100%. The blood returns from the lungs (high in O2) via the pulmonary veins to the left atrium. The blood passes from the left atrium via the bicuspid or mitral valve into the left ventricle. The left ventricle contracts and pumps blood through the Aortic valve into the Aorta artery. The Aorta artery delivers the oxygenated blood to the rest of the body. When the Atria contract, the Ventricles relax and fill with blood. This happens because at the time that the Atria contract, the tricuspid and mitral valves open to let blood flow to the Ventricles. When the Ventricles contract and pump blood, the Atria relax and receive blood from the Vena Cava. What is Systole and Diastole? In Diastole, the Atria contract and pass blood to the Ventricles. Systole is when the Ventricles contract and pump blood. In Systole, the right ventricle pumps blood to the lungs and the left ventricle pumps blood to the rest of the body. The Ventricles contract and pump in Systole. Another way to say this is that in Diastole, the ventricles relax and fill with blood. In Systole, the ventricles contract and pump blood. The number of heartbeats per minute is the heart rate. To get an accurate heart rate, you need to take your pulse first thing in the morning. This will give you the best reading of your heart rate after a full night's rest. The best place to take your pulse is on the radius side of your arm on the lateral of the large tendon groove. The average heart rate is 60 – 80 beats per minute. A normal heart rate is considered to be between 60 and 99 beats per minute. Tachycardia is a condition where the resting heart rate (RHR) is equal to or more than 100 beats per minute. Bradycardia is when the RHR is equal to or less than 60. A low heart rate is either due to medications or a higher level of fitness. In each heartbeat, the relaxation phase is approximately 2/3 of the total time for one heartbeat. Therefore, the contraction and pump phase is 1/3 of the total time of one heartbeat. The skeletal muscles are called voluntary muscles, because your thoughts manage the movements of your muscles. On the other hand, the heart muscle is called an involuntary muscle. Because, the contraction and relaxation of the heart muscle is involuntary. That is probably a good thing for people who might forget to keep their heart pumping! However, the heart still needs a special cell to send the message of when to contract. This cell is known as the pacemaker of the heart. The name of this special sell is the Sinoatrial Node, or the SA node. The Sinoatrial Node sends out an electrical signal for when the heart should contract. The SA Node is in the Right Atrium and is under the control of the Central Nervous System (CNS) and hormones. The components of the Central Nervous System are the Brain and the Spinal Cord. The CNS includes the Parasympathetic Nervous System and the Sympathetic Nervous System. The Parasympathetic Nervous System is active at sleep or rest and slows down the electrical signals of the Sinoatrial Node. The Sympathetic Nervous System is active when you are in a ‘fight or flight' state of perceived danger. In this state, the sympathetic nervous system will speed up your SA Node. The natural pace of the SA node is 100 beats per minute (bpm). It is the parasympathetic nervous system which slows down the SA Node during sleep or rest. The SA Node is also affected by the hormone adrenaline, which is now usually referred to as epinephrine. Believe it or not, your heart has a backup electrical signal, in case the SA Node fails. This node is called the Atrioventricular Node or the AV Node. When you take an ECG, an electrocardiogram, this is taking a picture of the electricity in your heart. Arrhythmia means an abnormal rhythm of the heart. The Coronary Arteries bring blood to the heart itself from the Aorta artery. The heart being a muscle, also needs a supply of fresh oxygenated blood. This supply of blood is delivered by the Coronary Arteries. The right coronary artery which feeds the right side of the heart. The left main coronary artery which delivers blood to the left side of the heart. A left anterior descending artery on the front of the heart. A right posterior descending artery on the back or posterior of the heart. The circumflex artery goes to the back of the heart. A blockage in the left coronary artery is known as the widow maker. 40% of heart attacks are widow maker heart attacks. The respiratory pump is composed of skeletal structures and soft tissues that work together to allow for respiration. Breathing is the movement of air in or out of the body. In order to get air in your body, your lungs have to expand. The external intercostal muscles are between the ribs. Inspiration is caused by the diaphragm and the external intercostals. The diaphragm goes down and the external intercostals go out, expand and cause inspiration. There are other key factors such as gas pressure. There is a general law of gases which is called diffusion. Diffusion means that gases move from higher concentration to lower concentration. Gases will also flow from a higher pressure to a lower pressure. This is how breathing works. The atmospheric pressure and its relationship with the air pressure within the lungs, called intrapulmonary pressure. When the air pressure within the lungs decreases, the air flows from outside the body into the lungs. When the pressure within the lungs is higher than outside, then the air flows to the outside, called expiration. For inspiration, the diaphragm and the external intercostal muscles contract and help the rib cage to expand, causing inspiration. In expiration, the internal intercostals and abdominals contract to help the rib cage to constrict, causing expiration. During exercise, the external intercostals and diaphragm contract, plus the accessory muscles for breathing like the pectoralis minor, scalenes and the sternocleidomastoid. The intercostals are type 1 fiber muscles – endurance muscles because they work all the time just like the heart. This next youtube video is an excellent presentation on breathing. The lungs bring air in and pass oxygen into the blood. Red blood cells make up 99% of the blood. Hemoglobin in your red blood cells attract and transport oxygen to the rest of your body. The Alveoli are a critical piece of the Pulmonary System. They appear similar to grape clusters off of the bronchioles in your lungs. The Alveoli fills up with O2 (Oxygen) and passes the O2 to nearby blood capillaries to the Hemoglobin in red blood cells. From here you can see how critical the red blood cells are to your health. You need the red blood cells to carry Oxygen to the rest of your body. The fewer red blood cells that a person has, the weaker their pulmonary system. Red blood cells are generated in your bones, in particular your long bones like the Femurs of your legs. They last approximately 120 days before they are regenerated. Your body, without you realizing it, will sense a lower level of red blood cells and trigger their regeneration. Erythropoietin (EPO) is a hormone that is produced by the kidney. yErythropoietin detects and promotes the formation of red blood cells by the bone marrow. That is right, your body is never static, your body is always changing. And if you give your cells the proper nutrition, you can keep regenerating healthy cells. You might think that smoke alarms are out of place in a review of the pulmonary system. On the contrary, now that you know how important Oxygen is to your health. You need to know why you must have working smoke alarms. The reason is CO – carbon monoxide. While it is true that hemoglobin attracts the O2 in the Alveoli, it is also true that hemoglobin likes CO even more. As a result, if the Alveoli fill up with Carbon Monoxide as well as Oxygen, your hemoglobin will choose the carbon monoxide over oxygen. Now, your blood is delivering carbon monoxide to all the cells in your body. Your cells cannot use carbon monoxide for any processes and they die. Make sure that you have working carbon monoxide detectors in your home to protect you and your family. If you understand the pulmonary system, but do not take precautions, what is the point of learning? Anemia is a decrease in the number of red blood cells. This is why Anemia can have such catastrophic consequences. Anemia can be caused by a lack of Iron, B12, Folate and B6. The classic symptom of Anemia is fatigue. The blood is composed of plasma, red blood cells, white blood cells and platelets. In most people, the red blood cells, white blood cells and platelets make up 42 percent of blood plasma. The red blood cells make up 99 percent of the blood cells while the white blood cells only 1 percent. However, the white blood cells are critical for your health. White blood cells are also called leukocytes and they fight infection. White blood cells are used for phagocytizing bacteria. Phagocytizing is the term used for eating bacteria. The platelets help repair blood vessels. They adhere to damaged walls and help trigger clotting. Therefore they have to be like highways. The arteries are bigger and thicker than veins. Arteries become arterioles and eventually become smaller and smaller. The smallest extensions of arteries in your body are called capillaries. The capillaries are where the magic of gas diffusion and exchange with cells occurs. The capillaries are the smallest blood vessel and can only fit a single red blood cell at a time. The capillary with one single red blood cell is the site of gas, nutrient and chemical exchange with the cells of the body. Once the capillaries pass oxygen, nutrients, vitamins, minerals to the cells, the low oxygen capillaries then become venules. The venules become veins and the veins go to the Vena Cava, the Superior Vena Cava for the upper body and the Inferior Vena Cava for the lower body. Arteries are like I95 which stretches from New England down to Florida. Veins are like the FDR drive which feeds Manhattan. Capillaries are like the streets which go to specific places within Manhattan. How does the blood travel against gravity you ask? The answer is that veins have valves which prevent the blood from flowing backwards. In addition, nearby muscles pump the veins to push blood along. Cardiac output is the amount of blood pumped per minute by your heart. On average, the heart will pump approximately 5 liters, about 5 quarts of blood every single minute at rest. Cardiac output increases to meet the metabolic demands of your muscle tissue. As intensity within exercise increases, so does your heart rate. Therefore, your heart rate can indicate the intensity of exercise. Heart rate x Stroke Volume = Cardiac output. So, let's assume you have a resting heart rate of 70 beats per minute (bpm). We know that the average amount of blood pumped per heart beat is 70 millileters. Therefore, multiply 70 bpm x 70 ml and that will give you 4.9 liters of blood, about 5 liters per minute. 4.9 liters then is your cardiac output per minute. For a non athlete, the max CO is usually around 20 – 25 liters. An athlete can have a max CO of 35 – 40 liters per minute because their hearts are stronger and pump more blood with each stroke. You need to know how to calculate the target heart rate for yourself or a client. Knowing the target heart rate will help you in designing a cardiovascular fitness program. The Karvonen formula is based on a measurement called the Heart Rate Reserve. First, you need to get your age predicted maximum heart rate. All you have to remember is to subtract your age from 220. 220 minus your age will give you your HR Max plus or minus 12 beats per minute. 220 – 60 = 160 HR Max. If you are 60 years of age, your max heart rate is 160 beats per minute. If you are 50 years old, then your HR Max is 170bpm. For a 40 year old, the HR Max is 180 bpm and so forth. 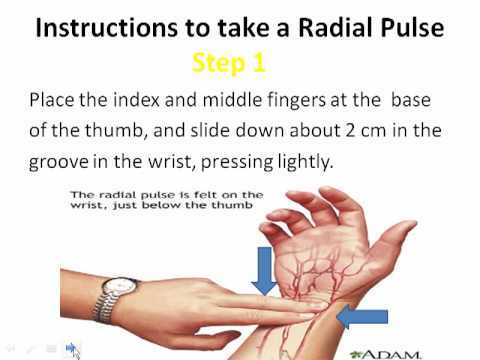 Get your resting heart rate as we spoke about before by taking your radial pulse for one minute. HRR = 160 – 60 , so the HRR in this case will be 100. Now we know that the HRR of this 60 year old individual is 100 beats per minute. Having a hrr of 100 makes it easy. To exercise at 70% intensity will mean that you take your heart rate reserve of 100 and multiply by .70 which equals 70. In this case, that will be 60bpm rhr + 70bpm intensity of hrr, which will equal 130 Target Heart Rate. For the average person, an intensity of 70 percent of the heart rate reserve is a good place to begin a cardiovascular fitness program. Mr. S is 27 years old and has a resting heart rate of 66 – What is his Target Heart Rate (THR) at 85 percent? First, figure out the max heart rate – 220 – 27 = 193. 193 is the age predicted max heart rate. Now, figure out his heart rate reserve. Remember, first figure out the age predicted max heart rate and then the heart rate reserve. Do not make the mistake of using the max hr to figure out intensity! The heart rate reserve is the max heart rate minus the resting heart rate. In this case of Mr. S, that is 193 – 66 = 127. Now, all you need to do is to add the resting heart rate of 66 bpm to the targeted intensity of 85 percent of the heart rate reserve. Intensity will be 127 x .85, which equals 107.95. Now add 107.95 to the resting heart rate of 66, which equals 173.95 target heart rate. [Heart Rate Reserve X % Intensity ] + Resting Heart Rate = Target Heart Rate. Another way to calculate the target heart rate is based on Max Heart Rate. In the case of Mr. S, this will be 193 max heart rate x .85 or 164.05. As you can see, the numbers given by these different formulas are different. So, be consistent with the formulas that you choose. NASM 5th edition gives a third alternative to calculate the target heart rate. The new formula is 208 – (0.7 x age) equals the max heart rate, and then multiply by the intensity. In the case of Mr. S, the formula will be 208 – (0.7 x 27) or 208 – 18.9 = 189.1. Max HR formula was 164.05. New NASM 5th edition method is 189.1 x .85 which equals 160.75. Let's use two more subjects, one is Mrs. S and Mr. H.
Mrs. S is 46 years old with a resting heart rate of 77 beats per minute. What is her target heart rate at 70 percent intensity. Age predicted maximum heart rate is 220 – age of 46 =174 bpm. Heart rate reserve = 174 – 77 rhr = 97. Karvonen formula = 97 HRR x .70 intensity = 67.9 + 77 bpm = 145 target heart rate. New NASM 5th edition method = 208 – 32.2 = 175.8 max heart rate and 70 percent of the max heart rate is 123.2. What benefits can you expect to see from cardiovascular training? Heart size will increase and get bigger. This will give you a stronger heart. Resting heart rate will decrease. Exercise heart rate will decrease. Maximum heart rate will remain the same or a very slight decrease. Stroke volume – how much blood is pumped per minute will increase. Blood volume will increase at rest. Fiber type will result in a greater appearance of type 2a fibers and type 2 will be more oxidative. The bottom line is that cardiovascular training will make you more healthy, fit and functional. When breathing, which muscles are used during expiration? Which muscles are used during inspiration? Is an increase in heart rate a normal response to exercise? Is an increase in diastolic blood pressure a normal response to exercise? If a person has chest pain when exercising, but none at rest, what is this a classic sign for? Which blood vessels carry blood away from the heart and to where? What is the stroke volume for an average person? Your client is 60 years old with a resting heart rate of 62 beats per minute. What is your client's target heart rate at 70 percent intensity? What is known as the pacemaker of the heart? Does this pacemaker have a backup? When blood leaves the left atrium, where does it go, through which valve? Will cardiovascular adaptation increase your max heart rate? What happens during ventricle diastole? Your external intercostal muscles and diaphragm are used. No, your diastolic blood pressure should not be going up. The pulmonary artery from the right ventricle to the lungs and the Aorta artery from the left ventricle to the rest of the body including the heart muscle itself. 70 ml per heart beat. 130.60 because the max hr is 160 and the heart rate reserve is 98. The Karvonen formula says to multiply the HRR by percent intensity and add the RHR. That is (98 x .70) plus the resting heart rate which equals 130.60. Sinoatrial Node also known as the SA Node. Yes, the AV node aka the Atrioventricular Node. Through the bicuspid or mitral valve. Pump blood to the lungs through the pulmonary valve and the pulmonary artery. No, your max heart rate is based on your age and cannot go up. As your age goes up, your max heart rate goes down. The amount of blood pumped per heart beat. The amount of blood pumped by the heart per minute. Cardiac Output is equal to your resting heart rate multiplied by 70 ml. Technically CO = RHR x SV. The ventricles pump blood and the atria fill with blood. The ventricles fill with blood and the atria is pumping blood to the ventricles. This is the conclusion of the pulmonary system review. Good luck on your pulmonary system test!